St Mirren have appointed Tommy Craig as their new manager. Craig, 63, was previously assistant to Danny Lennon, who left on Monday after the club decided against renewing his contract. Craig's coaching team will include current senior players Jim Goodwin and Gary Teale, the Scottish Premiership outfit revealed. "We look forward to our new management team taking the club forward," read a statement on the club's website. 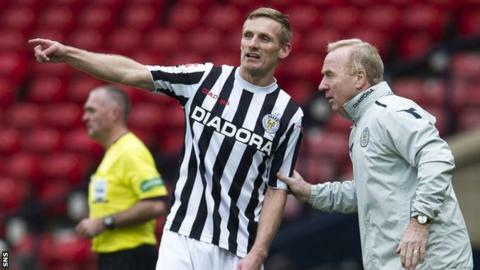 Former midfielder Craig, who has been assistant boss at St Mirren since 2011, began his coaching career at Hibs before holding similar assistant roles at Celtic and Aberdeen. Craig has also coached Scotland Under-21s, been first-team coach at Newcastle and had a spell as Hibs caretaker boss. He succeeded John Collins as Charleroi head coach in November 2009 but was sacked by the Belgian outfit the following April. St Mirren said Craig and his assistants would have an important role in improving the club's fortunes. "The initial work for Tommy will be to re-sign the players who are out of contract that he wishes to see remain in his squad, together with the identification of signing targets throughout the summer and programme our pre-season plans," the statement continued. "The remit from the board is to continue the foundations already in place at St Mirren, part of which is to encourage young players from our academy to develop within our club. "Tommy has a proven record in this area and, together with Jim and Gary, will work with our successful head of youth, David Longwell to ensure our young players continue to progress from youth academy to the first-team squad. "The supporters of the club have been magnificent in the support of this policy, we are sure they will wish Tommy, Jim and Gary every success." St Mirren struggled for spells of this term but Lennon secured their top-flight safety before Monday's announcement that he would be leaving.